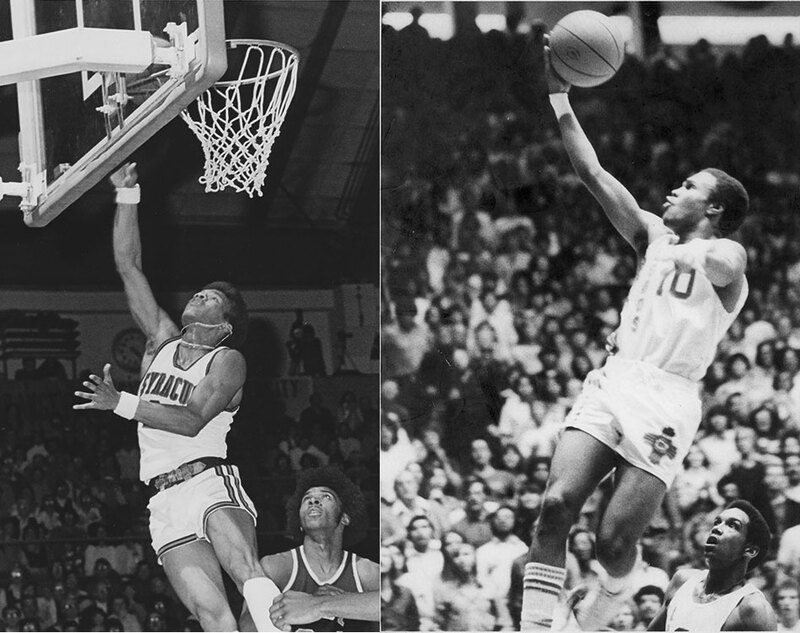 In the Williams family, basketball runs like a fast break, and Jimmy and Rickey demonstrated that talent in Western New York and beyond. Jimmy Williams was a spectacular point guard whose speed and quickness helped dominate the hardwood. A 1973 graduate of East High School, Jimmy led the 1972-73 team to an undefeated season. During that campaign, he averaged 32.1 points a game, which helped him earn the New York State Player of the Year Award. He was a two-time All-Western New York first team selection and was named to the Buffalo News All-time All-WNY third team. After graduating from East High School, Jimmy continued his basketball career as a Syracuse University Orangeman, where he was a point guard for four years. During his first season, he became the first freshman ever to start a game for Syracuse and appeared in 12 games. He helped the Orange advance to its first Final Four with 19 points in an upset of North Carolina in the 1975 NCAA Tournament. In his junior year he led the team in scoring and steals. He was a co-captain in his senior season and again led the Orangemen in scoring. In his four years at Syracuse, Jimmy scored 1,119 points in 101 career games and helped lead the team to four NCAA Tournament appearances. While Jimmy was setting that standard for hoops at East High School, his brother Rickey was doing the same for the Timon Tigers. In just 56 games Rickey scored 1,156 points (20.8 points per game) for the Tigers and was a first team All-WNY selection during the 1973-74 campaign. After graduating from Timon, Rickey attended the University of New Mexico for two years before transferring to Long Beach State. At Long Beach, Rickey averaged 15 points a game as a junior, and in his senior season he led the team in scoring with 18.1 points per game. In total, at both schools, Rickey finished with 1,353 points. Rickey was drafted by the New Orleans Jazz and played in 44 NBA games in the 1982-83 season, averaging 3.3 points.